FuRyu has released the first screenshots of its Doraemon: Nobita’s Chronicle of the Moon Exploration game for Switch. The game, based on the March 1, 2019-due movie of the same name, sees players cultivate their very own “Rabbit Kingdom” like the one that appears in the movie to create a kingdom all their own. 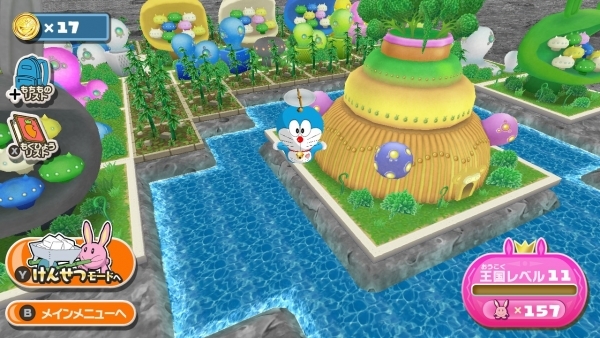 Players can also control Doraemon, Nobita, Gian, Suneo, and Shizuka to run around the map, and the game’s story is the same as the movie. Additionally, there are various mini-games, including racing, action, and puzzle. Doraemon: Nobita’s Chronicle of the Moon Exploration is due out for Switch on February 28, 2019 in Japan.